Alan Levine had a great post the other day (what else is new?) about how online learning communities, such as eMoocs and such, would do better to never situate an “end point” for a course and just keep the lights burning for folks. He situates this point within the context of the Connected Courses, where a lot of university folks are experimenting with how to transform their curriculum with elements of open design and open learning. Alan cites DS106 and its #4life motto as an example. 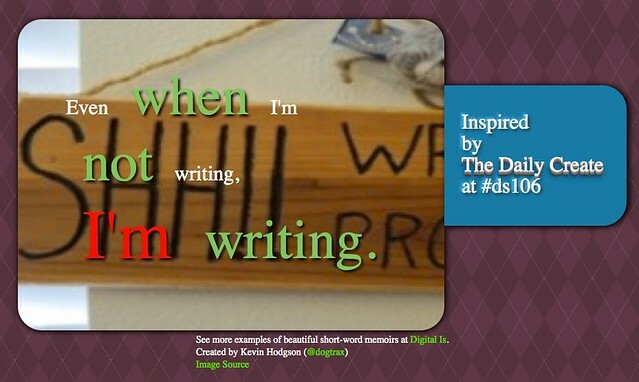 That’s what I do so love about DS106 …. it never seems to end and I can jump in and out as I please. I think what makes that system work, along with the great sharing, is the Daily Create … every day, there is something new to do. It only takes a few minutes to do the Daily Create, but the act of getting that email update or seeing the call for creativity on Twitter reminds me of the presence of DS106. Even if I don’t do the create, I remember a bit of where I’ve been within DS106. I get re-anchored. The breadcrumb leads me back. That identity with a learning space is important. For many, particularly those in the Connected Courses, their teaching year no doubt revolves around semesters. The course they teach ends when the semester ends, and then things start up all over again. But when you add an open learning element, really, things should never quite come to a close. Why would it? 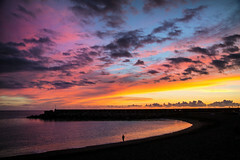 Our learning never stops and if the connections forged have been true and honest and worthy, the space should continue. Which is not to say this is easy to pull off. We’ve tried to keep our conversations and making going with the Making Learning Connected MOOC the past two summers. We’d love folks to stay connected in our spaces all year. It doesn’t really happen. Life intervenes. People get exhausted. Other priorities bubble up. We loosen our threads. But every now and then, we’ll see a burst of activity, as folks come back together with an idea or a share, and these echoes of the intense summer of the CLMOOC re-emerge in a powerful way. We still see the CLMOOC Make Bank as a growing connector of our ideas, as a sort of legacy project (modeled on, what else, DS106). Meanwhile, I am taking a grad class right now that uses Blackboard as its LMS, and everything I write in there … I know it’s only temporary. My words will be eaten up by the LMS in a few months. The doors will close. The lights will go out. We’ll be done. This is important as I think about Alan’s points because what I write in that particular space is just enough to do the assignments. It’s me, the student, not me, the writer/connector, and when those words disappear … I could care less, to be frank. We have not really forged any true learning community connections in that online space (even though we are required to have “conversations” each week in the forum). It all feels so very forced and fake to me. The doors to the LMS will close and I won’t care. 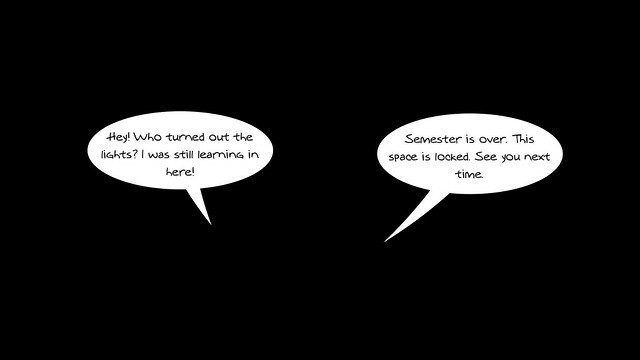 Close the doors to the CLMOOC, or DS106, or other learning spaces I am in, and I would be in an uproar. And saddened. Those learning spaces, and those colleagues in those places, matter to me. I would be lost as a writer, learner, teacher, maker without those connections. Keeping the lights on is challenging, but important, if we are trying to keep to our ideals of learning as an open adventure. I’ve been challenging myself to do something around the theme of “light” this week at the Making Learning Connected MOOC, using only audio to tell a story. I failed at it many times. It turns out that telling a story completely with sounds is pretty difficult, even with the experience I had doing this with DS106 earlier this year. I had one story idea of someone wandering through a dark house, lighting candles. I had another one with an alien invasion. They didn’t work and those stories were abandoned. Finally, I realized I should stay simple and soulful …. I should create a soundscape story of a day that begins with the light of sunrise and ends with fading into sunset, as told from someone reading a book. The audio becomes the story the reader is reading. I still had troubles here. I struggled with how to represent parts of the day in audio only, and then realized I could use church bells ringing out the hours as a sort of anchor point for the listener. You will hear an odd sound near the end of the story. This was created by someone using a software program that turns a bitmap of an image into audio wave files. The image he used is of the moon. So the sound is of an audio interpretation of a picture of a moon, if that makes sense. I want to dig around for that software program, because I think it has possibilities for storytelling, right? I can’t say I am completely happy with the results of From Sunrise to Sunset, and I am left wondering: Does the story drag on? 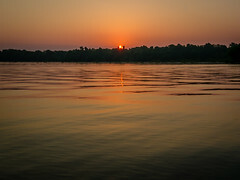 Does it capture the splendid beauty of morning as light hits the world? The liveliness of the day as we move about under the sun? The slow settling of the night as the Earth turns away from the sun? Is light even really a theme, here? Or just an artificial storytelling construct? You know, I got questions for myself. I am making the soundscape story downloadable for anyone to remix, as part of the ethos of the CLMOOC. I’ve tinkered with animated GIFs before (most notably, with DS106) and when I saw a fellow traveler in the Making Learning Connected MOOC world sharing an animated GIF meme, I thought: I gotta try that. So, I did. Here’s how I went about it. First, I found a clip on YouTube that I liked (of Lisa Simpson playing her saxophone). Then, I grabbed the url of that video and went into a site called Make a Gif, which does what it sounds like it does: it creates animated GIF files out of YouTube videos. I took just the first three seconds of the video, as the loop of Lisa playing while Homer kicks back and dreams of other things while Lisa kicks out her saxophone jams. Then, I went into an online photo editor called EZGif, which allows you to layer in text on top of animated GIF files. I’ve run into problems hosting animated GIF files before and I have found that if I use Flickr and grab the “original” image (not the embed code that Flickr gives you, as that will flatten the GIF down to a static image) via copy/paste, and place that original upload file directly into my blog post, it will remain animated. Pretty nifty, eh? Go give it a try and share out what you made as part of this Make Cycle around memes. We’re moving to shift gears out of this Make Cycle but it never really ends. You can enter into the conversation with the CLMOOC whenever you arrive. Yesterday’s Daily Create was to create an emoji movie poster. I suppose this could have gone a few ways: we could have made a poster for a movie told entirely in emoji (which I don’t think anyone did) or we could made a poster for an emoji movie (which is what I did). 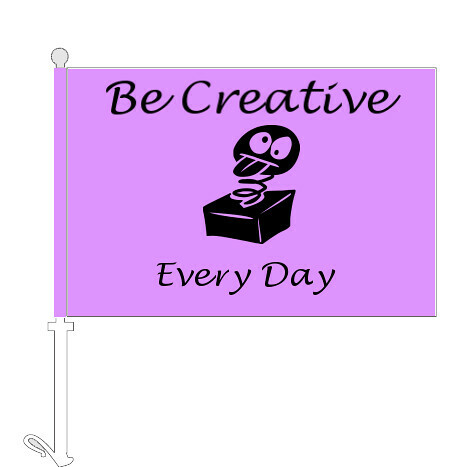 There are probably other options, too, but that’s the beauty of the Daily Create. 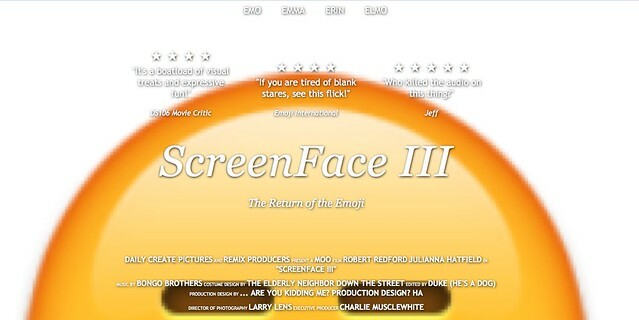 I went into Webmaker Thimble, using a Movie Poster template that walks you through all of the steps, and remixed it for a fake movie: Screenface III. What’s funny is that the emoji I used got blown up (not literally) so large that you can only see the top of its head, with odd eyes on the horizon of the page. I tried to fix it and then realized: it works better this way. Or maybe I just got lazy and realized: good enough. I’ve been having a blast making teasers for this summer’s Making Learning Connected MOOC (Massive Open Online Collaboration). This is the second year of the CLMOOC, and last year was so much fun, we are doing it again –with various wrinkles to allow last year’s folks to keep playing with learning and enough entry points for new folks to come on board and have fun. Alan Levine, over at DS106, recently shared out an online generator for creating your own Monopoly game cards, and I thought: Gotta use that! So, I’ve been creating Chance and Community Chest cards with a CLMOOC bent, and sharing them one at a time on Twitter (our hashtag is #clmooc). I decided to move all of the cards into a comic, too. 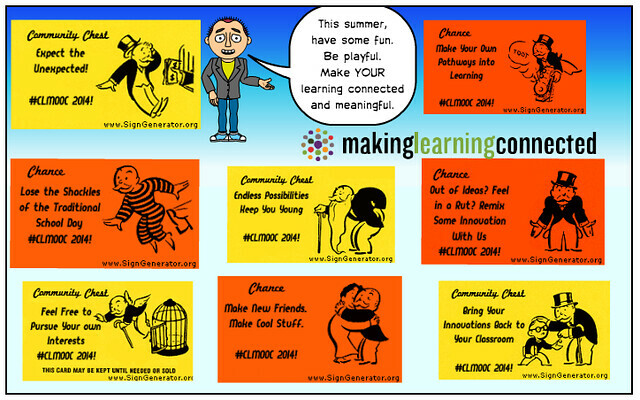 I invite you to join our Making Learning Connected MOOC this summer. It’s sponsored by the National Writing Project and it is part of the Educator Innovator Network’s Summer of Make, Play and Connect. The MOOC is designed to get you playing, learning and reflecting, and connecting with other educators in a stress-free environment (hey, it’s summer). The whole thing kicks off in mid-June and goes until August, although you should feel free to enter and exit as your schedule permits. I’m already making things …. come join me. I created it with Coggle If the image is a bit fuzzy, you can do right to the project on Coggle itself and zoom around. The Daily Create with DS106 keeps me on my toes. Even on days when I don’t do the Daily Create, I find myself thinking about it during odd moments during the day, as if I were creating in my head. It’s strange. But that’s the power of a good idea, right? This morning, the assignment was to create a persona poem. It could be real or fictional, and I went with a poem about Charlie Parker (see my blog tagline). Sometimes, I share out this old digital poem about Charlie “Bird” Parker. Bird: a video poem from Mr. Hodgson on Vimeo. One of the strangest Creates in some time was something known as the PetSwitch. 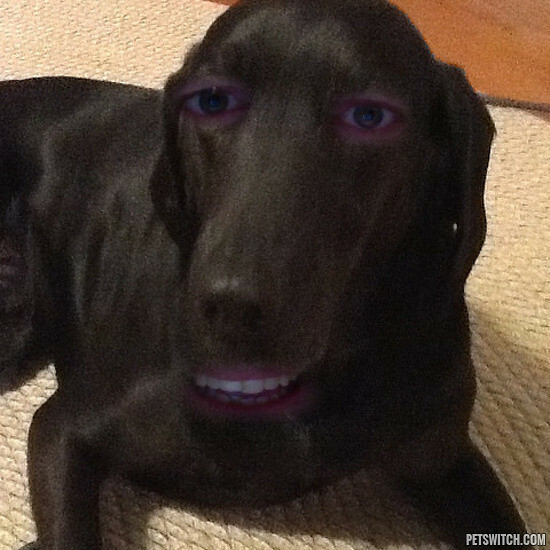 We went into a site that allows you to superimpose your image on your pet’s image, to create … this odd thing. The assignment was to write the story, but I could not get past seeing my dog Duke with my mouth and eyes, and so I went with a simple six word story. What was in that kibble anyway? And finally, the other day, we had a Prime Number Poetry assignment, where we had to use five different prime numbers as part of poem where the numbers were the rhyming words of couplets. That’s not as easy as it sounds (or maybe it doesn’t sound easy). if they happen to still be living there, and if they happen to be alive. unless I've gone away, then you can text me in Heaven. And how could I forget? The other day, in honor of my fellow dawg’s birthday (Alan Levine, aka @cogdog), the Daily Create theme was creating a dog-themed photograph for Alan, one of the minds behind DS106. I went into webcomic mode, riffing on a periodic cat vs. dog idea. 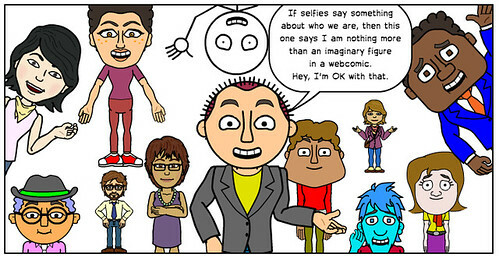 Some convergence of “selfie” ideas came to my mind yesterday, with the DS106 Daily Create riffing off creating a “bad selfie” to someone sharing the cute video and CommonSense Media posting an interesting piece about girls and selfies and body image, and then I decided to do my own version of the Ellen selfie, but with webcomics. 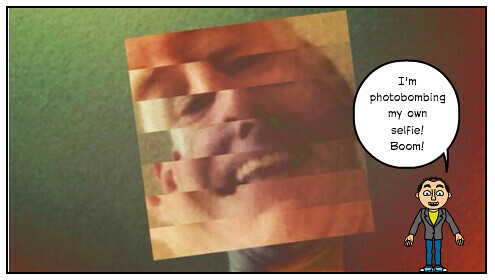 This was my submission to the Daily Create, using a filter to warp my head an then photobombing my own selfie with my comic self. I love this video. It captures the oddity of the selfie with humor. Selfie from Andy Martin on Vimeo. The Daily Create prompt yesterday was a “tell your life in seven words” kind of activity. It reminded me of Six Word memoirs, which reminded me of the Mozilla Thimble template created by the National Writing Project, so I dug it up and worked on it for my seven-word-life-story. I was trying to get at the idea that even when I am nowhere near a pen or keyboard, my brain is always working on writing something. I just need to remember later what it was that I was writing. PS — you can create your own seven word or six word memoir with Thimble, too. Either remix mine or remix the original. Does spelling count? 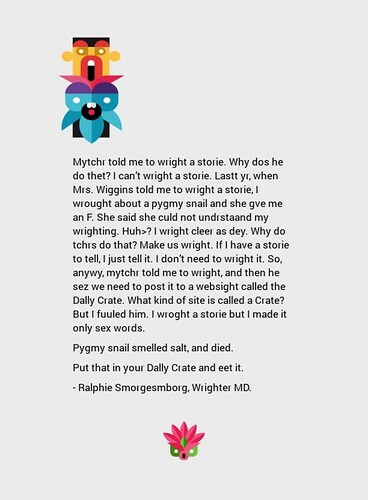 For today’s Daily Create at DS106, the prompt is to write a story riddled with spelling errors. (That’s harder than it seems, particular for a teacher).